Washington Bison and Buffalo Hunts | Bow & Rifle Hunting. If you're a Washington big game hunter with any kind of real hunting experience, you've probably tried your hands at many different kinds of game. If you live in Washinton there are many areas where hunters can enjoy hunting beautiful animals. Unfortunately, what Washington doesn't offer is many hunts where big game hunters can hunt America's largest game animal on public lands. 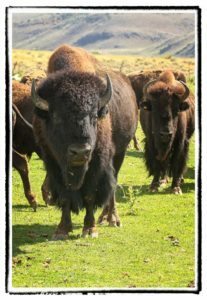 As discouraging the lack of Washington buffalo hunts might be to you in your quest to bag a buffalo, it doesn't have to be the end of the world. So what should you do if you're determined to hunt a bison or buffalo? The first thing you'll need to do is look outside of Washington and be willing to travel to attain your dream hunt.